Open-source fun from the Blender foundation. 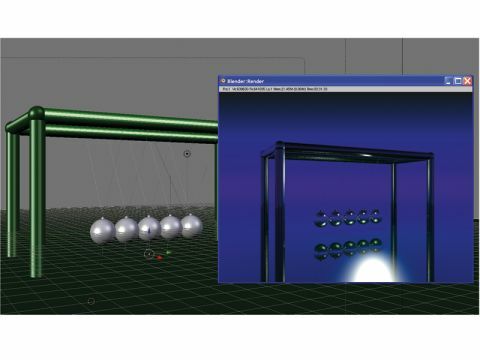 Taking over where previous tools like POVRay left off, Blender offers good basic animation and rendering behind a somewhat inscrutable interface. As a Linux-based project, the application design isn't the most intuitive, even by the dense standards of 3D. If you're used to more conventional Windows-style interfaces you'll spend a lot of time finding your way around. Also, like many open-source projects, Blender suffers from abandonware issues and feature creep. The alternative Yafray rendering module showed great promise but now seems to have fallen by the wayside. And some of Blender's features have a perpetual not-quite-finished feel to them as developers lose interest in polishing them once the essentials are done. Despite these drawbacks, the feature set is vast, and with time and effort the visual output quality can be as good as that from professional packages. If the idiosyncratic interface was only more conventional, this could be a worthy competitor.